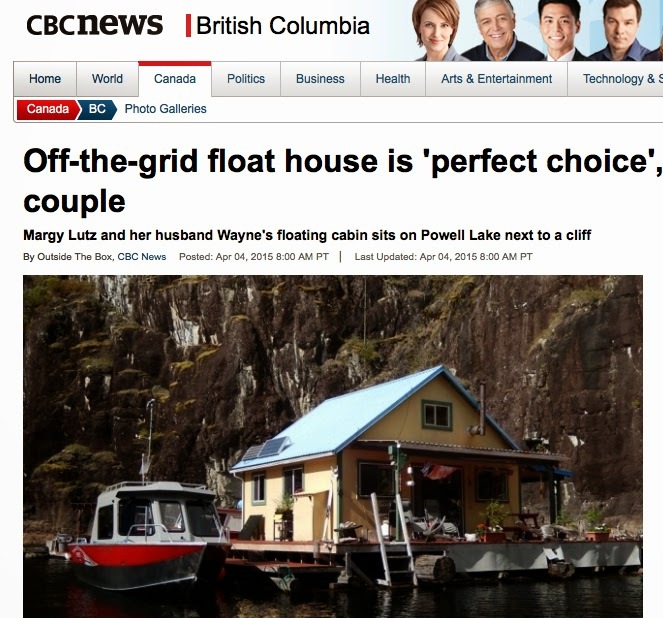 Wayne and I are honoured that Willow Yamauchi from CBC Radio selected our float cabin home to be part of a radio rebroadcast about alternative homes in Canada called "Out of the Box" that will air during the BC long weekend. In addition to our Powell Lake float home, the hour long presentation includes Canadians living in a yurt, earthship, cob house, and converted shipping containers. 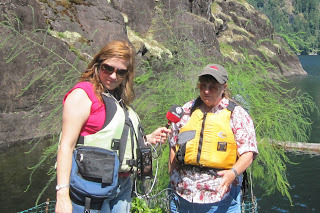 In addition to the radio program, the CBC News for British Columbia website published a very nice article about our cabin to go along with the radio program. Our portion of "Out of the Box" was a rebroadcast of a 2013 interview with Willow Yamauchi (who grew up in nearby Lund). You can read more about that program here. There isn't an online link to the whole "Our of the Box" program, but you can hear my portion that originally aired on the CBC show "North by Northwest." Along the roads and trails right now there are some beautiful flowers reflecting the hue of the summer blue skies. I stopped to take some pictures of the Wild Chicory plants. I even captured a buzzing bee gathering a bit of nectar. I did some research and learned that Chicory (Cichorium intybus) is a perennial herb that is native to Europe and the Middle East. It was later introduced to North America and has now become "naturalized" to our locale. I've heard about Chicory from my parents who had to drink it as a coffee substitute during World War II, but I never made the connection to this lovely flower, or the fact that it is related to cultivated versions such as Belgian endive and radicchio. Mel and Wayne heading up the lake. 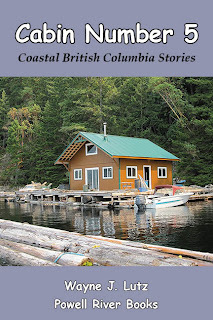 A few weeks ago, Mel Edgar, a reporter from the Powell River Peak, came up the lake to our float cabin for an interview about Wayne's newest book in the Coastal BC Stories series called Beyond the Main. 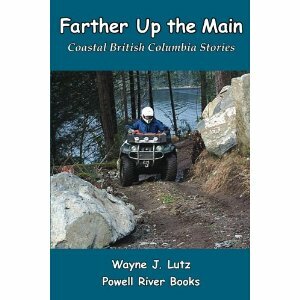 The book was a catalyst for a conversation about ATV riding in Powell River, and quad riding in general. 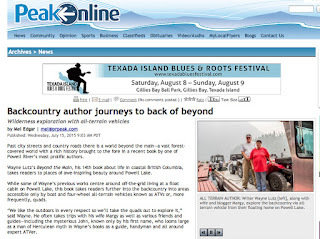 The article entitled "Backcountry author journeys to back of beyond" was published in the Wednesday Peak on July 15. You can click on the image at the left, or this link to read it online. In addition to our quad experiences, the article had lots of information provided by members of the very active Powell River ATV Club. If you are interested in getting in touch with the Club, you can contact Ted Wrubleski at wrublet@telus.net. Wayne and I aren't expert riders (yet), but we do enjoy exploring the many logging roads and trails built in the Powell River backcountry. You can read about some of our recent adventures in Beyond the Main. 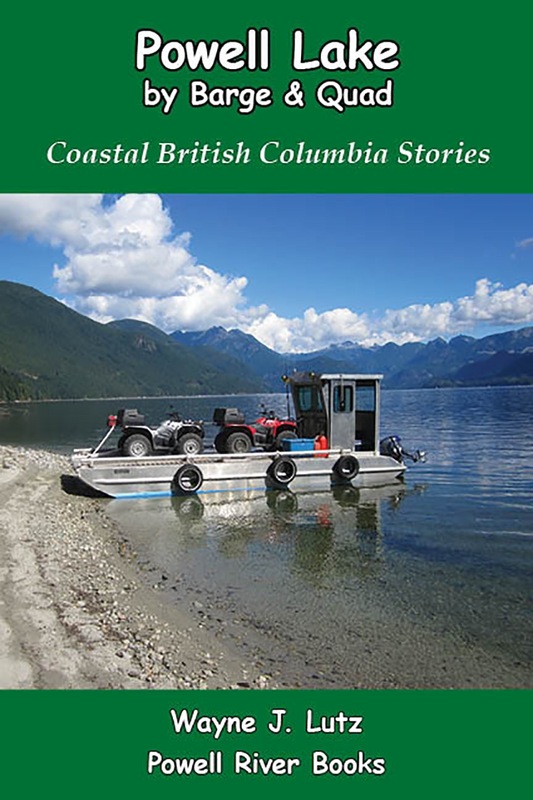 It's available locally in Powell River at Coles or Breakwater Books. It's also available online at Amazon.com and many other booksellers in both print and e-book formats. Posing for the photo shoot up close. Lorquin’s Admiral (Liminitis lorquini) is a large butterfly found throughout the Pacific Northwest. It’s black in colour with a band of large white spots across the middle both wings and orange tips. I saw my first specimen at the cabin in June 2015 while it was exploring our front porch. When I went out to see if I could get a picture, it landed next to me and crawled onto my foot, just begging to be photographed. Lorquin’s Admiral butterflies live on nectar from flowers. They are often seen sunning on the ground or plants, and are drawn to moist soil where they sip for nutrients, primarily sodium which they cannot derive from nectar. Eggs are laid on willow, cottonwood, plum and cherry trees. The larva creates a unique structure called a hibernaculum from a leaf stem and silk threads that they generate. Inside the hibernaculum, it spends the winter, but on occasion will exit to sun itself on the nearby branch. The Himalayan Blackberry is prolific along the south coast of British Columbia and Vancouver Island. It's an invasive species that grows in thickets and crowds out other local plants. As the name indicates, it is native to Asia that was introduced in the Pacific Northwest for fruit production, but they have spread and gotten out of control. In our area, the white blossoms start to form into small hard berries in July. By August, they are ripening to large, juicy, sweet berries begging to be picked. This year is going to be particularly early with all the not weather we've had. I know that they are an invasive species that can clog riverbank, or engulf huge areas, but when you can pick such luscious fruit for free and make it into so many wonderful things, it's hard to hate it. Just look at this bowl full or wonderful fruit. Wild blackberries are used to make lots desserts and preservatives. I usually pick a nice big crop at the Shinglemill Marina before coming up the lake. At home in the cabin I make them into pies, cobblers, pancakes, jam, and canned whole to enjoy all winter long. Each year in August, my hometown of Powell River celebrates all the wild blackberries that grow in every nook and cranny with a Blackberry Festival and Street Party. It's such fun. They block off about a kilometre of Marine Avenue and local vendors and restaurants set up booths and street performers entertain. This summer we had a guest at our cabin. John used to teach with Wayne at Mt. San Antonio College in Walnut, California. He's an avid pilot and motorcyclist. This year he came north on his bike. John's a retired Fire Captain. His station was responsible for providing the US National Weather Service with updates including measuring the amount of rain. When equipment became obsolete, they gave it to him. Painting the outside of the massive rain gauge. John knows how much Wayne enjoys monitoring the weather. They were both aeronautical instructors teaching aviation weather courses. John had an extra antique rain gauges, so he loaded it on his bike before heading north. The bronze gauge was in excellent condition, but silver paint on the outside was peeling. Wayne sanded it and added a new coat. Next was a mount for the cabin deck. We can get some nasty winds. Our other good friend John took on the task. He tried every plumbing and builders supply store in town. John never gives up. He went to the auto wreckers and found what he needed, but the pipe was crushed. Dropping the US rain gauge into its new Coastal BC home. He removed the dents, mounted it on a plywood base, and painted it yellow (Wayne loves colour). We picked it up ready to install down to the drilled screw holes. John's a good man! The Pale Tiger Swallowtail is another large butterfly common to our coastal region in British Columbia. It's similar to the Western Tiger Swallowtail but has a much lighter appearance. The Swallowtails appear later than the Mourning Cloaks. My first sighting this year was in mid-May and they stay through late-July. The forewings are a pale yellow with black edges and bands radiating downward from the top. The hindwings have the distinctive pointed tails, much like the forked Barn Swallow’s tail. Supposedly, the tails evolved as a protective mechanism. If grasped by birds in flight, they will detach and allow the butterfly to escape and survive. Like most butterflies, it lives on flower nectar. The larvae have more specific dietary needs. Eggs are laid on willow, poplar, sycamore, or alder trees so when they hatch their preferred food is readily available. We have lots of alders in our logging slashes, so that makes them prime Swallowtail breeding territory. The larvae of the Pale Tiger Swallowtail eat foliage of woody plants then turn into pupa to wait out the winter. Butterflies emerge in the spring to enjoy the sweet nectar of blooming flowers, and start the mating and egg laying cycle all over again. The males have an interesting behaviour called mud-puddling. They use small puddles and muddy ground to get moisture and nutrients from the damp soil. Recently, I found two butterflies in my garden doing just that. Here's a short video of their dance-like endeavor. Kurt and his Aviat Husky float plane at Hole in the Wall. Last year Kurt and his Aviat Husky floatplane came to share in a summer of fun with the Hole in the Wall gang. He enjoyed his float cabin stay so much, he returned again this summer. 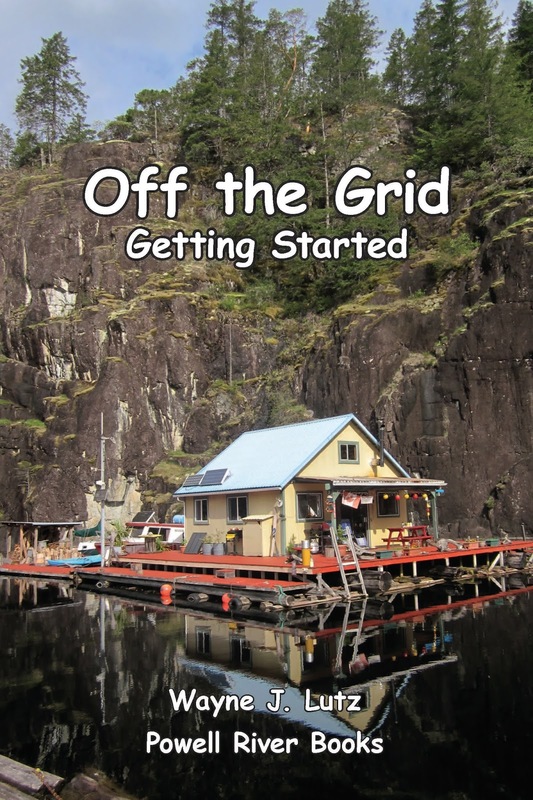 Kurt will be using the float cabin as his headquarters to continue to explore lakes and inlets along the south coast of British Columbia. Stopping by for a visit at our cabin. Scattered along the rocky cliffs of Coastal BCs shoreline and fjord-like lakes, you will see red-barked trees interspersed with the pines, firs, hemlocks, and cedars. These are the majestic Arbutus trees (Arbutus menziesii), also called the Pacific Madrone. The Arbutus are also evergreens, but they have broad leaves instead of needles. The Arbutus has the red trunk and is tucked behind the fir tree. It grows in very dry areas, and is very often found wedged in cracks on sheer granite cliffs. They usually have several twisty branches and often lean over at steep angles. The dark, shiny leaves form at the ends of the branches, mostly near the top of the 30-foot tree. They remind me of Manzanita bushes on steroids. The most distinctive feature of the Arbutus is it's red trunk and branches. The bark is smooth and often peels and flakes off as the tree grows. 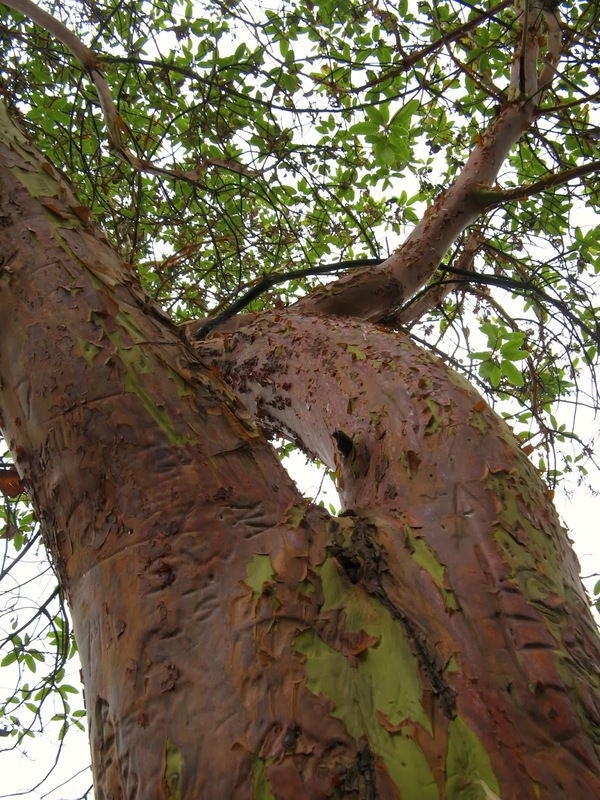 The wood of the Arbutus is hard and not good for the lumber industry. Besides, their growing location isn't conducive to harvesting. That leaves them for all of us to enjoy. That's fine by me. Berries form in the fall. In the fall, berries form in cluster. They are edible, but not very flavourful. Space is limited in my float garden. You can only grow so much in four one by two metre beds. Consequently, I use pots spread around our cabin deck to grow things like potatoes, beans, peas, squash, rhubarb, garlic, cucumbers, tomatoes, peppers, herbs, small ornamental trees, and flowers. My float has a natural critter deterrent. It's on a pulley system. I bring it in to work, and send it out to float along a log boom in the lake. It's watery moat keeps hungry critters away. But not so for my deck pots. Cutting the mesh to size was easy. My main enemies are woodrats (also known as packrats) and mice. Both rodents love the fresh young shoots and leaves from my plants. Leave, stems and whole plants can get stripped overnight. It's so disappointing, not to mention expensive in cost, time and energy. I hand "sewed" it into a cylinder. After an attack on my pepper plants, I decided to fight back. I made two pot covers. 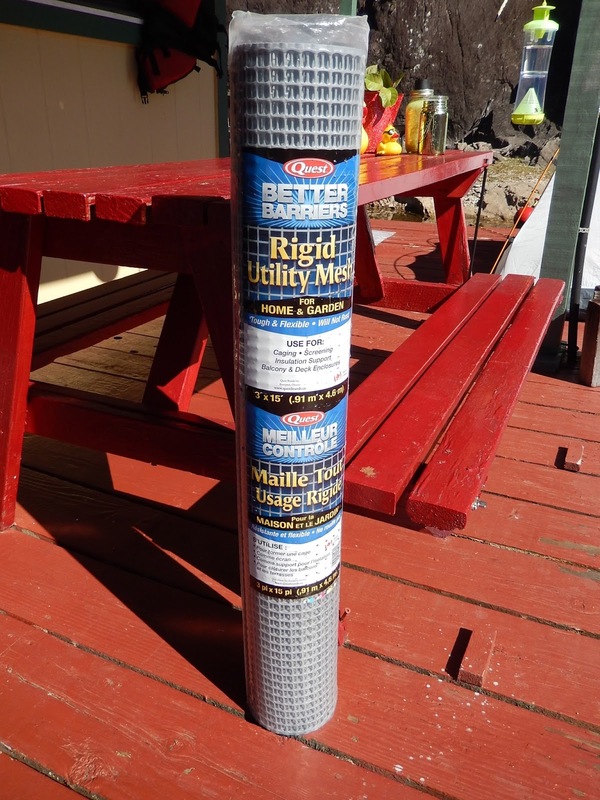 I was going to get chicken wire, but I found something better, Quest Plastic Rigid Utility Mesh. 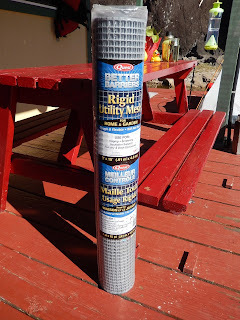 It was easy to use, the holes were smaller (1/2 inch), it was 3-feet high, and cost less. The 15-foot roll was plenty with extra for later use. Cutting a circle to sew on the top. I measured the circumference of the pot, added several inches for growth and cut the mesh with utility scissors. I then used polypropelene twine to hand "sew" the two sides together to make a cylinder. Then I cut a circle to sew on the top. I didn't want the critters to climb the side like a ladder to get in the pot. Easy to lift off for watering and tending. The protective cages are tall and wide enough to allow for plant growth. They let in the sunshine and won't blow away. Now my peppers are safe to regrow and start producing. After one week they already have a few pepper sets. And they look pretty professional. This week we've been blanketed in smoke from several of the forest fires blazing in British Columbia. We've been lucky here in Powell River. No man or nature made forest fires, but with our tinder dry conditions we have to be extremely careful. Goat Island gets hazy by noon on July 5. On Saturday night, Wayne and I went out in the boat after sunset to see if there was any aurora activity in the northern sky. All we could see was a dark band on the horizon that we though were clouds. Goat Island disappeared by 3:00 p.m.
We awoke on Sunday to a blood red sun and hazy smoke starting to obscure the sky. It got progressively worse until we could no longer see Goat Island a little under a kilometre away. It was hard to breathe and there was falling ash. Sunday was the worst, and flights into and out of the Powell River Airport had to be cancelled. Monday was a little better, and each day has improved as they've gotten the fires under control. Before there were dark stains around the burner. I love my Premier propane range that I got during our kitchen upgrades in 2011. I use the front two burners extensively, so over time they white enamel around the propane burners has discoloured. Dark stains had baked into the white surface, so my regular sponge and soapy water didn't do the trick. Applying the vinegar and baking soda paste to the stains. I've heard about using baking soda and vinegar as a natural cleaner, but I'd never tried it before. Wow! What a miracle cleanser. Use a toothbrush and Q-tip for those tight spots. I made a thick paste of baking soda and vinegar and covered all of the areas that were stained. I let that sit for fifteen minutes before using a sponge to remove the majority of the discolouration. The darkest spots took two applications. I was so pleased that it was so simple. I should have done it a lot sooner. Now that I know the trick I'll keep on top of it rather than wait. The stovetop is all clean after using baking soda and vinegar. While I was at it, I used the solution on my white plastic spoon holder that was darkened by coffee stains. It was clean and brand new looking in the wink of an eye.